i'm exciting to be announcing the prize winners for the covert robin! it was so much fun looking through all of the great projects that were linked up! winner of MY handmade market tote is: Wendi of Sew Cat Sew Creations winner of a fat quarter bundle from Jill (Made with Moxie) is: Samantha of At Home with Mrs. H.
Congratulations to all of the winners! I hope you all had a ton of fun making and getting your gifts. So it's time to reveal some Covert Robin stuff, right?! Last week I got my package in the mail. We (Violet, Henry and I) were super excited to open it! This is what we found inside. A Noodlehead divided basket made by the lovely Courtney of Mon Petit Lyons! I've been wanting to buy this pattern for quite some time now, but haven't yet. How fun is it to get something in the mail made for you that is something you've had on your own "to make" list and then it just magically shows up in a box all wrapped up and made just for you?! Awesome! I love the colors, they are so bright and cheery. Violet and Henry noted that the flowers look like pinwheels. And Courtney picked out the fabric because she knows how much I love birds! See those little guys? So cheerful! And then to top it all off she tucked a little surprise inside this beautiful basket... Moon Rabbits from Yuwa in pink...thinking I could make something for Violet. How sweet! I'm thinking a skirt? Violet's thinking she wants her own divided basket made with this fabric...and Henry, is thinking he wants the same fabric in blue now! Ha, ha! Speaking of moon rabbits in blue, Courtney just made some adorable baby pants using that fabric. Yup, she will soon be welcoming their third little baby boy! Goodness, she's been sewing like mad, quilts and pants and more, getting ready for baby and she still took time out to make such a lovely gift! So thankful for that! Thank you Courtney! And, shortly before I received my gift in the mail, I got word that my gift to Karen arrived in Australia! Yay, I was worried for a bit because it seemed to be taking longer than I had expected to get there, but it made it safe and sound. I have to say, it took me a long time to figure out what to make Karen! I mean, what do you make someone who already creates so many awesome things herself? 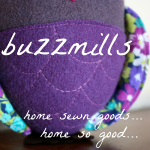 And, not only does she make, but she also designs the patterns! Karen makes amazing quilts and bags and she is a knitter/crocheter too! Hmmm, what to make someone with such amazing talent? Well, I decided to take a cue from my partner last year, Diane, and what she gave me and made Karen something that would be useful, but that she would likely not take the time to make one for herself. 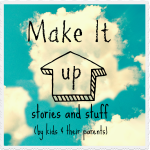 There are so many things that we all have on our "to make" lists, but that we will likely never ever get to right? I was reminded of Rachael's perfect padfolio pattern (which yay, I won!) when I was testing her pinafore. I thought it would be a perfect gift for Karen! 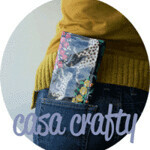 Perfect for her to carry around business cards and for a notebook and pen for her to use to sketch out new pattern designs wherever she goes. I made the outside of the padfolio with part flea market fancy and part handprinted fabric. And, of course, I felt the need to bring back the "Covert Robin" because he's just so awesome (I think so anyway)! On the inside I kept the bird "theme" going with Anna Maria Horner's Field Study and Ellen Luckett Baker's Flying Geese and then balanced it all out with Essex Linen Denim. I even found a "quilty" looking notebook at Target to add inside! I had so much fun making it. I hope she is able to get tons of use out of it and enjoys it! 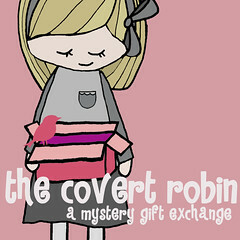 And, don't forget to link up your Covert Robin gifts here! It's time to show off your covert robin gifts! I hope you all have had a ton of fun making and then, of course, waiting eagerly for the mail to arrive. I can't wait to see what you've all been up to this past month. There are over 160 people participating in this gift exchange! That's a lot, hooray! Want to know who everyone is? Well, here you go, a list of blogs who are participating. Click around to get to "know" each other and to find some new blogs and friends.